The Supreme Court directed all the States and Union Territories to consider the plight of Acid Attack victims and take appropriate steps with regard to inclusion of their names under the disability list. Apex court bench of Justices M.Y. Eqbal and C. Nagappan said that State shall upon itself take full responsibility for the treatment and rehabilitation of the victims of acid attack as per the Guidelines provided in Laxmi vs. Union of India. Three Judges Bench of Supreme Court, answering a reference to it in New India Assurance Co. Ltd. Vs. Hilli Multipurpose Cold Storage Pvt. Ltd., has reiterated that the District Consumer Forum can grant a further period of 15 days to the opposite party for filing his version or reply and not beyond that. 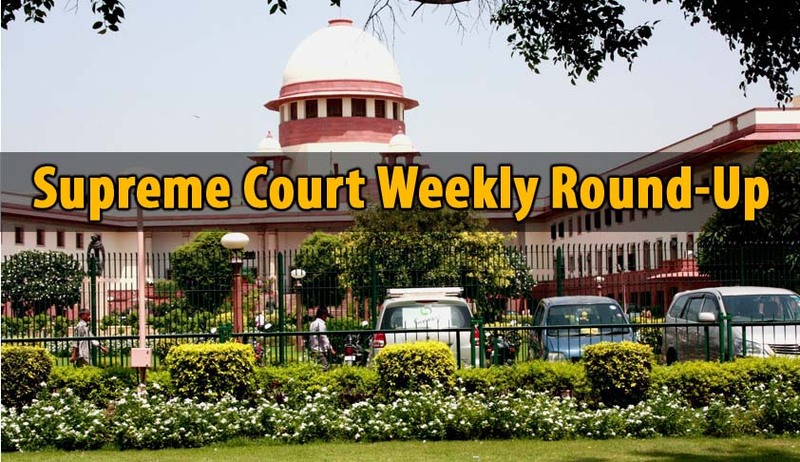 The bench comprising of Justices Anil R. Dave, Vikramajit Sen and Pinaki Chandra Ghose, rejected the contention that the provisions of Section 13(2) (a) of the Consumer Protection Act are merely directory and not mandatory in nature. The Supreme Court held in a recent judgment that parties to a civil litigation are not entitled to produce additional evidence, whether oral or documentary, in the appellate court, but for the three situations contemplated in Order 41 Rule 27 of the Code of Civil Procedure, 1908 (for short “the Code”). A two Judge Bench of the Supreme Court of India on Thursday, upheld the validity of Haryana Panchayati Raj (Amendment) Act, 2015 (Act 8 of 2015), which interalia introduced the minimum educational qualification for candidates to contest the panchayat elections. In a significant judgment rendered today, the Apex Court upheld the constitutionality of two legislations passed by the states of Bihar and Odisha to tackle corruption in their respective states. In a setback to former CBI Ranjit Sinha, the Supreme Court on Monday, ordered handing over of original visitors’ diary of his official residence to a court-appointed panel to probe whether his meetings with accused and others led to botching up of investigation in Coalgate cases and helped various accused. The Supreme Court on Friday, ordered Nestle India to respond to an appeal filed by Food Safety and Standards Authority of India (FSSAI) against Bombay High Court order lifting ban on Maggi. In a relief to author Shobhaa De, the Supreme Court on Friday, closed the case pertaining to breach of privilege notice issued to her by Maharashtra Assembly for her tweets against decision to make it mandatory for multiplexes to screen Marathi movies during prime time.